In this second part in our Series on Explosions and Flammability we will discuss Dust Flammability. 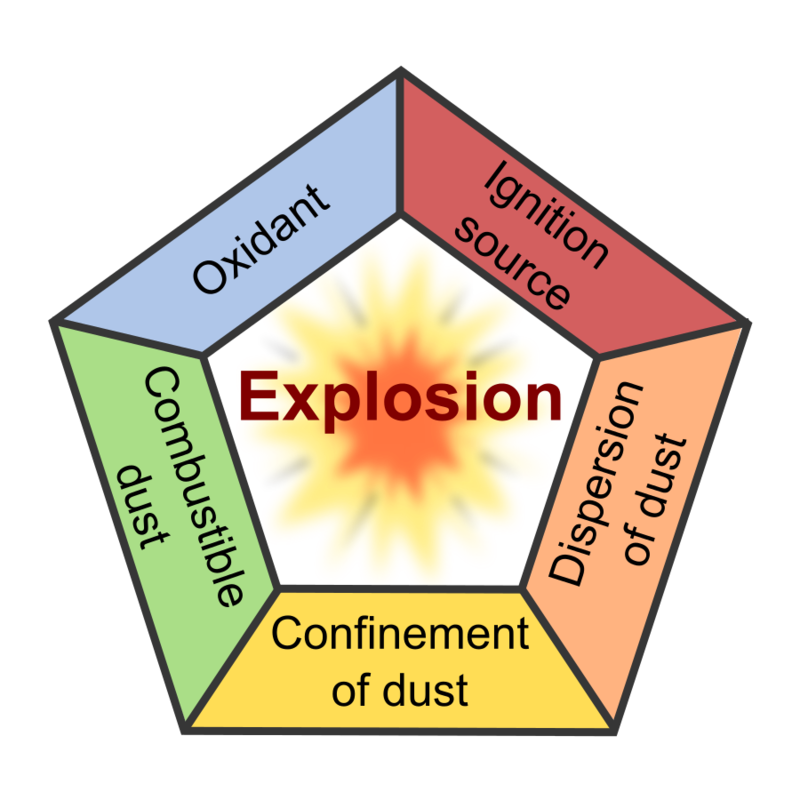 The dust pentagon below shows that there are five (5) elements necessary for a dust deflagration to occur. Although confinement is considered to be a fifth requirement; this is not an essential condition for a dust deflagration to occur. The lower explosion limit, or Cmin, for dusts is given in grams per m3 of powdered material in a volume of air. About 30 grams per cubic meter is the lower explosive limit for most flammable dusts. Typically, upper explosion limits are not defined or determined for dusts. The “Explosion Severity Test” is a standard dust test used to quantify the maximum pressure of a dust cloud explosion (Pmax) and the speed of the pressure rise (KSt). One of the best ways to prevent dust explosion is to minimize dust accumulations on equipment surfaces, floors and high beams. R.C. Costello and Assoc., Inc. implements one of a kind process engineering with exceptional experience, process safety support and top-notch customer service. Give us a call today and see what we can do for you!